Southern Illinois University Press, 9780809329588, 272pp. 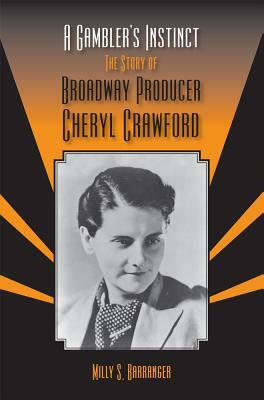 Broadway producer Cheryl Crawford (1902–1986) declared in her 1977 autobiography, “The theatre has been my life.” Crawford was notoriously circumspect about her private life, and only now, with Milly S. Barranger’s insightful biography, is her full story revealed. A major Broadway producer in an era when women producers were exceedingly rare, Crawford found unprecedented success with the plays of Tennessee Williams, including The Rose Tattoo and Sweet Bird of Youth, but her enduring legend is as a musical producer, having brought Kurt Weill’s One Touch of Venus, Lerner and Loewe’s Brigadoon and Paint Your Wagon to the stage. Her commercial success, though, was balanced with the founding of studios that would enable actors to explore their art outside the strictures of commercial theater. She cofounded the Group Theatre with Harold Clurman and Lee Strasberg, the American Repertory Theatre with Margaret Webster and Eva Le Gallienne, and the Actors Studio with Elia Kazan and Robert Lewis, but her idealism was constantly frustrated by unfulfilled artistic promises from her male counterparts and by the chronic shortage of funding for the nonprofit enterprises. As Barranger traces Crawford’s career as an independent producer, she tells the parallel story of American theater in the mid-twentieth century, making A Gambler’s Instinct both an enjoyable and informative biography of a remarkable woman and an important addition to the literature of the modern theater. Milly S. Barranger is a distinguished professor emerita of dramatic art at the University of North Carolina at Chapel Hill, former producing director of the PlayMakers Repertory Company, and author of "Unfriendly Witnesses: Gender, Theater, and Film in the McCarthy Era "and "Margaret Webster: A Life in the Theater.""""